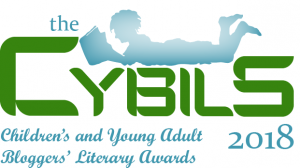 This month we are exploring some of the fantastic nonfiction children’s books that have been nominated for 2018 Cybils awards. Let’s look at the sweet picture book Mama Dug A Little Den by Jennifer Ward and illustrated by Steve Jenkins. Have you ever spotted a hole in the ground and wondered what or who made it? Jennifer Ward finds the answers for you and presents them in the two layer text format that works so well. dark and deep and wide. Who or what might be inside! The main story is gently rhyming text with short sentences, perfect for reading aloud. When readers want to find out more, they can read the accompanying text which is denser and has more advanced scientific vocabulary. In the author’s note in the back matter, Ward explains that although the title suggests “mama” dug the dens or holes, in some cases the males dug the holes, or two or more animals worked together. Some, like the Eastern cottontail rabbit, may “borrow” burrows from other creatures. Also, some of the animals live in the burrow throughout their lives, not just when they have offspring. So informative. Mama Dug a Little Den will likely to appeal to young readers who enjoy nature and animals. It would also be wonderful for reading snuggled together at bedtime. Share a copy today! Pretend you are in a burrow. Build a “fort” out of chairs, pillows, and blankets and read the book inside. Come visit the STEM Friday blog each week to find more great Science, Technology, Engineering and Math books.Opens in a new window Note: this is a new link as of 10/2018.